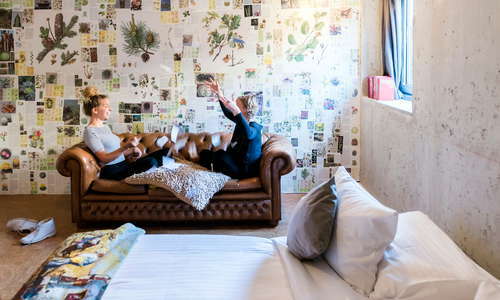 Go easy on your pocket and the planet at this eco-conscious budget boutique ho(s)tel, with 7 room categories-from dorms to family rooms--all decorated with artsy flair and recycled materials--and service that is truly warm and personal, no matter who you encounter. Eco-tourism, social travel and boutique ho(s)tels are trending in the travel world right now, and Ecomama effortlessly combines them all. Organized activities like (free!) Red Light District tours, pub crawls and movie nights make this an ideal choice for solo travelers looking to socialize. 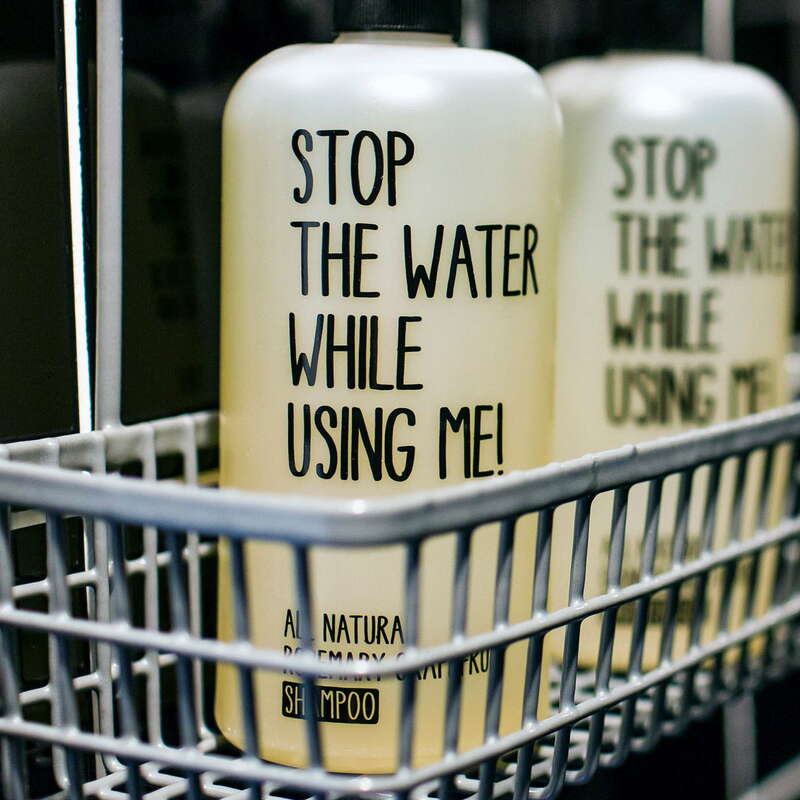 And, of course, Ecomama earns its green credentials with recycling initiatives and involvement in social projects, and there are eco-friendly bathroom amenities, LED lighting, and a green roof, too. 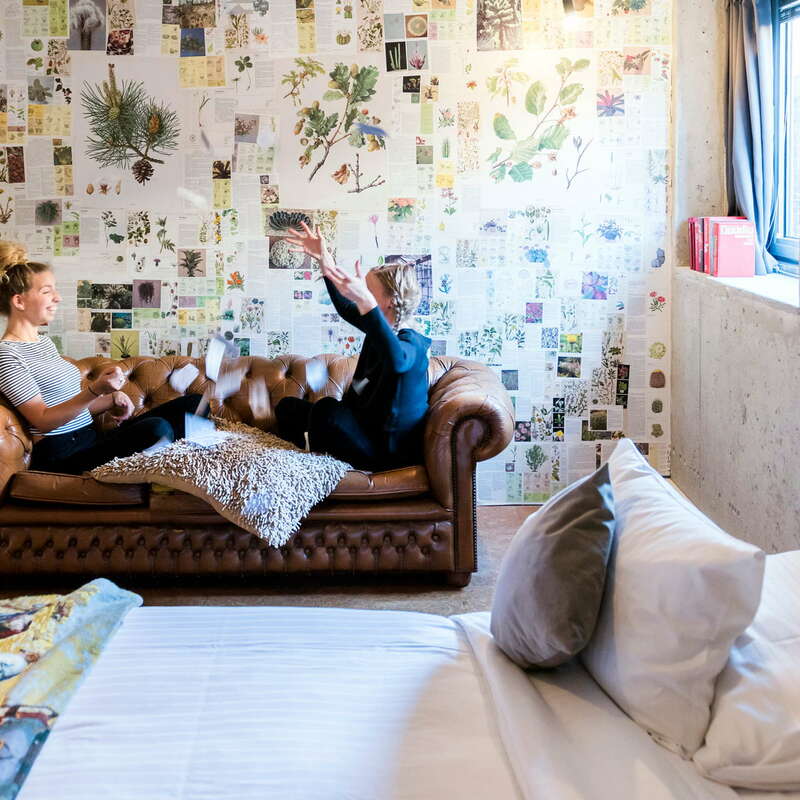 From the “El Cheapo 12-bed dorm” with shared bathrooms to the “Double Private Superior room”, a large double with en suite bathroom, there’s a room type for every budget at Ecomama, including family rooms with pull-out sofas for the little ones. Beds are comfortable, with all-natural Cocomat mattrasses, organic fairtrade linens and Yumeko eco-robes in the bigger rooms. Family friendly attractions nearby include Royal Artis Zoo, TunFun Indoor Soft Play Area, The National Maritime Museum and Nemo Science Museum, among others. The (shared) bathrooms are basic but clean. 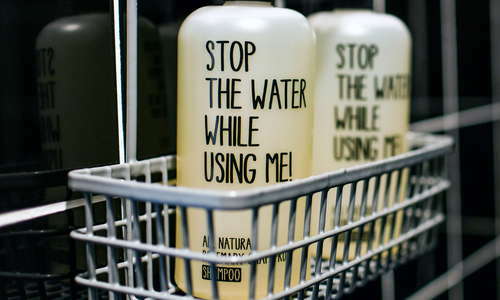 Towels and all-natural soap and shampoo by cosmetics brand STOP THE WATER WHILE USING ME! are provided, while 30-second push button eco-showers hammer home the message. Enter through a trendy café to find a reception desk constructed from vintage books and maps (apparently recycled from the travel agency that used to occupy the building) with free iced tea and water, and an adjacent common area with a cozy Coachella-meets-Urban Outfitters vibe (there’s a teepee with fairy lights and loungey furniture, a distressed leather sofa, indoor swings and Insta-ready forest wallpaper with suspended bicycles, of course) but also a fully-kitted out (shared) kitchen with family style table, Smeg fridge, stove, and microwave for guests to use. There is also an honesty bar stocked with drinks and snacks. 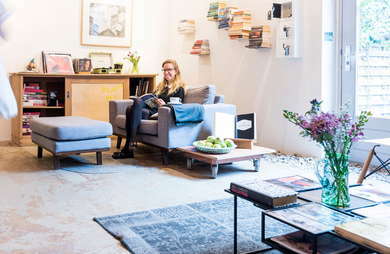 The FIX café offers premium STOOKER coffee, as well as smoothie bowls and bagels in a blush pink interior with trendy neon signage that seems straight out of a hip design mag. The FIX café also has a good selection of (local) booze, and a few house cocktails. Weather permitting, guests have the use of a small garden. 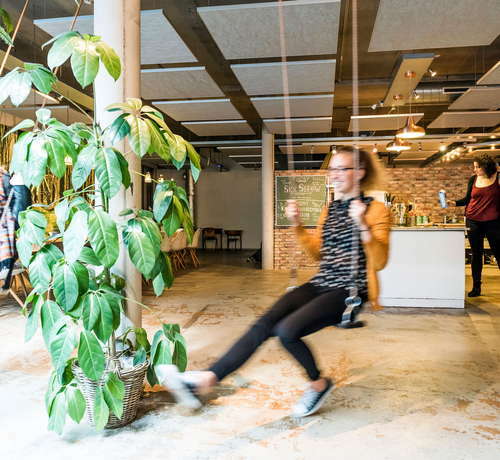 Located on a busy street in the Jewish Quarter near Waterlooplein, this ho(s)tel offers good access to the Old Center, Eastern Canal District, Oosterdok and Plantage on foot. Metro access is available at Mr. Visserplein or at Waterlooplein, with plenty of tram stops in the area. You can also rent a bike for €12.50 per day. For cheap-and-cheerful Israeli food (you’re in the Jewish Quarter, after all), you can’t go wrong at Hummus House (8-minute walk), where you’ll find housemade hummus served with warm pita bread and plenty of pickles and sauces. Three-story pagoda-style Sea Palace (13-minute walk) is a great place to grab dim sum and Peking duck with the whole family. Near the zoo, you’ll find De Pizzabakkers (10-minute walk), where crisp-crusted artisan pizza is baked in Italian-style wood ovens. Killer cocktails are served at Hiding in Plain Sight (4-minute) walk, but they don’t come cheap at this not-so-hidden cocktail bar. If it’s old world charm (and more affordable drinks) you’re after, Café de Sluyswacht (13-minute walk) has been around since 1695, when it was a lock-keeper’s cottage. Today, it offers pretty views of Oude Schans canal, local beer, and bitterballen (a typical Amsterdam bar snack). With its fun, quirky look, convenient amenities, and genuinely nice staff, Ecomama is so much more than just the buzzwords it represents.